Social innovations do not come “out of the blue” but capitalise on different resources, e.g. human capital and public support, available at the locality where they are developed and put into practice. Moreover, social innovations, perceived as indicators and messengers, respond to social problems occurring at a particular time and place. They point to local areas and issues blocked off from change and inform about local opportunity structures to tackle social problems and needs. Hence, new routine-breaking services or approaches of addressing users say a lot about the specific nature of a location, e.g. whether its political system is open and participatory instead of being a closed shop driven by elites or whether certain policies are realised by collaborative working and networking instead of uncoordinated action. By applying this perspective on social innovations to the district of Friedrichshain-Kreuzberg in Berlin, one gets a rather mixed image of a locality that describes itself as young, multicultural, creative and “always on the move”. Indeed, Friedrichshain-Kreuzberg represents a unique mixture of different historical legacies, streams of thinking, social movements and communities that overlap, intermingle and collide with each other at the same time. Merged into one district in 2001, Friedrichshain-Kreuzberg is characterised by the East-West divide that brought along different groups of residents, neighbourhoods and urban planning approaches. Friedrichshain was East Berlin’s workers district with industry premises alongside the Spree River and huge (classical old-style) housing stocks. Kreuzberg, having also traditionally a proletarian character, became the assigned home of West Berlin’s guest workers and a homeland of creative bohemians pursuing an alternative subculture distant from the “normal” labour market. From these colourful histories emanated (at least) two discourses that still have an impact on today’s local policies. First, a discourse on solidarity, social coherence and a fair share of opportunities for everybody in the district, which leads to a simple question: what holds a diverse, both in terms of origins and capabilities, urban society together? Second, an economic discourse that centres on the question how to re-industrialise the district and how to spread an entrepreneurial spirit among its residents. Today’s answers of these challenges are manifold. With regard to urban coherence, many local pundits conjure the integrative strength of the Kiez, a German synonym for well-functioning neighbourhoods based on reciprocal solidarity. In order to preserve those “social habitats”, policymakers attempt to spread an attitude of “togetherness” and cooperation among local stakeholders and inhabitants. When it comes to the economic development of the district, hopes emanate from companies, symbolising the spirit of a new creative industry, such as Universal Music and MTV that based their headquarters in Friedrichshain’s old factory sites. Other strategies focus primarily on an upturn of the local economy, e.g. those that stimulate entrepreneurial skills among migrants and job seekers by combining the issue of (social) integration with local trends such as tourism and gastronomy. A key reference point for social innovations in Friedrichshain-Kreuzberg is the concept of spatial policy interventions dividing the urban space in manageable units and areas of coordinated action. Four of our six social innovations introduced below conceptualised their services by taking the particularities of certain urban and social spaces – housing blocks, quarters and neighbourhoods – into account. However, for an analysis of this approach two different dimensions have to be separated: first, the professional dimension at the level of social workers and administrators after which spatial policy interventions, involving all local stakeholders, are a panacea against urban decay that is more promising than uniform programmes administrated single-handedly by the authorities. Second, “spatial policies” are combined with debates of public self-assurance. By addressing local identities and strengthening people’s local patriotism (e.g. through campaigns such as “We in Kreuzberg”) a sense of belonging to the district should be enforced. However, in order to avoid a simplistic picture that portrays Friedrichshain-Kreuzberg euphemistically as a dynamic breeding ground for social innovations it is worth noting that there is growing social division among its residents. On the one hand, there is an ongoing influx of well-educated better-offs, such as cosmopolitans, young professionals, silver agers and double-income households. This clientele, having little or no interest in local politics and social problems, choose the district for life and living due to its central location in Berlin and its cultural richness. On the other hand, there are native residents and rather ordinary people – immigrants, bohemians, single parents and GDR-socialised seniors – with low income who are becoming ever more marginalised in Friedrichshain-Kreuzberg. This diverse clientele of vulnerable people, being hard to reach by traditional social policy programs, is increasingly addressed “in a different way” by innovative projects and service arrangements as we will show in this report. Of course, this differs according to policy fields and groups. However, certain target groups, e.g. single mothers or youngsters without a school degree, have cumulated problems and therefore need comprehensive support packages. By and large, we found many routine-breaking service arrangements and projects in Friedrichshain-Kreuzberg. We thereby confirm the self-image of many local activists describing their scene as Berlin’s “spearhead of an active civil society”. However, actual contributions of “active citizens” and third sector organisations concern foremost the issues of labour market integration and child care but lack innovations dealing with the most urgent problem of the district: the scarcity of social housing. This imbalance goes back to the fact that in Germany housing policies are determined by the federal government, whereas the Berlin Senate (state level/Land) and the districts (local level) have merely some leeway to decide how to allocate and manage existing housing stocks. Structural developments, such as substantial investments in new (social) housing stocks, are beyond the power of Berlin’s government (Senate and district). In this respect, the housing market differs much from other policy fields that leave space for decentralised solutions. As a consequence, potential innovators, e.g. initiatives of residents or neighbourhood groups, are thus far limiting their activism to creative forms of protest and public presence. To put it in a nutshell: rising rents and the gradual replacement of the poor (immigrants, single parents, the unemployed) are hot public issues in Friedrichshain-Kreuzberg that have triggered an ongoing debate on urban development and social cohesion but have not yet led to innovations in social housing policies. The six innovations introduced below were chosen according to the following criteria: first, we applied a broad and neutral definition of “innovation”, indicating merely new ways to deal with social problems while abstaining from predefined (normative) goals. Second, we distinguish between different drivers, such as managerialism, participatory governance and/or forms of progressive professionalism, e.g. schools opening up to the community or social workers bridging their services with local support networks. We are convinced that innovations in the realm of local social policy consist necessarily of both a certain project and an underlying background approach. The respective scale of innovations and their future developments depend on another factor: the implementing power of the stakeholder(s) who put(s) them into practice and the relationship to the dominating policy coalition. This tension is (very often) reflected in practical and symbolic levels of innovations. On the one hand, innovations are about looking at concrete offers and services; on the other hand, they are also about being engaged in the dissemination of messages about the wider meaning and visions of their practices and offers. The six social innovations to be presented in this report were chosen based on background interviews with local stakeholders and our own investigations of available resources (newspapers, websites, policy documents). The choice of innovations, ranging from urban revitalisation programmes and new forms of vocational training to family-minded policies, remains exemplary and incomplete. Each example stands for similar innovative projects in the district that we cannot introduce for reasons of space. 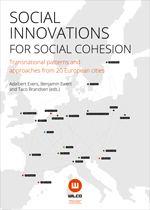 The portraits of the six innovations, introduced by a comprehensive description, are organised around three basic themes: 1) types of services and ways of addressing users; 2) internal organisation and modes of working; 3) embeddedness of the project in the local welfare system. For each case study, we draw on at least two interviews: one with the respective social innovator and one with experienced users and/or local observers of the innovation. The innovations are presented in the context of policy fields. We start with two innovations in urban revitalisation, continue with two projects in the field of labour market integration and finish with two cases of family-focussed policies. In practice, however, most of our examples pursue integrated actions plans. They thus belong to more than one policy field and address more than one group we focus on, for instance by bridging urban renewal with the stimulation of entrepreneurialism.